Scripture was Mark 2:1-12, where four friends of a paralytic bring him to see Jesus. Blocked by the crowd, they dug through the roof and lowered their friend into the room where Jesus was. Aigner pointed out that the crowd was there to see Jesus, and yet blocked this man from receiving help. Todayâ€™s â€œcrowdï¿½ï¿½? seems to embody the belief that those in need must have done something wrong to be in their position of neediness, so they should have to figure it out on their own. Aigner asks us to not be the crowd, but to be the friends, willing to advocate for those in need. LSSI deals with people with major needs, who need long-term help. People often have more than one issue; homeless people often have health issues (no insurance), for example. LSSI staff has shrunk from over 4000 to between 1800 and 2000 in the last few years. Education and health insurance are holding their own in the state budget. LSSI places for adoption between 300 and 700 children per year, and has a real need for homes for medically challenged kids. There are currently about 18,000 kids in the system, down from 53,000 several years ago. LSSI recently commissioned a survey, receiving enough results to be statistically viable. The primary question was whether Lutherans should use their voices to influence public policy. So over 96% of Lutherans surveyed support or strongly support influencing public policy, despite the Lutheran history of â€œquietismï¿½ï¿½?. Aigner asks us all, as â€œfriends of Jesusï¿½ï¿½?, to raise our voices, talk to our representatives, take care of each other. Our faith is an â€œaudibleï¿½ï¿½? faith. Footnote: I used a false friend. â€œPenetrantâ€? in the given context means something like â€œovert and intenseâ€?. I think itâ€™s best if Larry just fixed it in. Thank you. 1. Cross-of-Nails seams to me to be a wide umbrella, a loose-knit network of diverse kinds of communities and organizations, which otherwise retain their individual tradition. And so, the relevant address in Germany for me were (a) the Johannes-Gossner-Haus in Mainz and (b) the evangelical students convention at the university there [donâ€™t rely on my denominations; I canâ€™t translate these official namings properly]. (a) is no congregation at all (but a center to coordinate social and political activity) and (b), at least upon a brief visit there, didnâ€™t look promising to me at all: too unfocussed on theological, social OR political things anyhow (I couldnâ€™t find a single proper indication in the showcase on either sunday services or cross-of-nails background). So, maybe Iâ€™ll come back to them if opportunity arises, but for regular membership, they donâ€™t fit me. 2. Methodists – I paid a few visits there and felt very much at ease – in this â€œmost churchlikeâ€? of free churches in Germany (as the pastor of my now â€˜forsakenâ€™ Baptist congregation properly described them). I established that, indeed, they should not be held responsible for G.W. Bushâ€™s obduracy since, as their (retiring) pastor told me, Bush has completely banned every emissary of his own church from the white house and shut himself off from his fellowâ€™s near general consternation at his policies. There was a declaration on the wall, coming from the (international) leadership of the Methodist church, which denounced the war in Iraq and asked for forgiveness for the huge degree of humoring (among us of) those lies that facilitated leading to this situation. As the pastor told me, the American bishops have been in the forefront to reaching agreement for this declaration and were very much relieved once the others warmed up for that matter too. But yet, there were â€œcounter-indicationsâ€? for me to not join them. First, to make a second conversion in a few years (I became baptist in 2002, after 17 years Lutheran) is not a readily done thing, and second, as I said, Methodists up to this point seem to me to make quite well-guided practical steps in determining their â€œmiddle-groundâ€? between moral dangers and exremisms, but they do so on a rather non-theoretical basis, which makes me wonder when these steps will cease to please me, and how I should or could react on this, – for it is another thing if a body of people is thinking and acting on his own authority or if there is some common ground of confession on which you can found an appeal. And quite apart from practical suspicion, I do not share their â€œphilosophyâ€? of church or congregation. Baptists have a clear understanding of community, which hinges on the act of decision of the individual believer, which is equivalent, in their theology, with baptism. Lutherans have likewise a clear understanding of a universal (â€˜catholicâ€™) and â€˜popularâ€™ church, in which all members of society (stemming from and baptised in Christian families) are called to belief (which, in any case, is the only possible fulfillment of their lives, from a biblical standpoint) and either follow with their hearts or follow not. In the face of such divergences, I take it to be a â€˜contingentâ€™ question when it comes to decide which understanding has a â€˜better performanceâ€™ in keeping true to the central issues of faith, – a question relevant to time and place. And in this relevancy, and from my personal perspective of concerns, I shifted back to the Lutheran view of â€˜Everyone Called, Each One Having Ears May Answerâ€™. More on that in a minute ..
.. 3. Mennonites were a third candidate, since they too subscribed to a recently published â€œYearbook of Social Justiceâ€?, which denounced that infamous way of how the social balance of western societies is subverted in these final years of the neo-liberal system of â€œglobalizationâ€? (for as I now know, this system will soon collapse and give way to either fascism or a reorganization of the global power balance that requires much moral effort of each single of us snobbish westerners to accept a more humble life in an economy weened off its decades-long practice of druglike monetary politicies; – Alan Greenspan be praised). — But Mennonites are all but non-existent in my surroundings, and whatâ€™s more, they too have grown too diverse for my liking too. 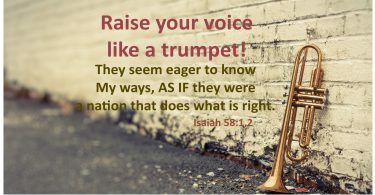 ..
â€œAnd unless people close their ears voluntarily to a warning and challenging voice, have I any right to leave them before having helped them to that voice in all outspokenness.â€? ; As to that, the scene has changed completely. Fully aware that the opposite side would judge it otherwise, I say they DID close their ears. Itâ€™s only that the â€˜other sideâ€™ is and remains vastly restricted to the pastor and the elders. For they consistently and strenuously worked against any attempt of mine to reach the generality of this congregation with the core of my concern, – be it even in the most conciliatory of ways, after consultation of the elders and with official declaration on their and my part that itâ€™s solely my personal view of things. That has grown so penetrant, and so humiliating to me (given how much of thought and â€˜lifebloodâ€™ I spent to detail to my fellow believers what I happen to see as the natural consequences of our mutually professed faith) that I may really say, Iâ€™ve done all I could. I have returned the responsibility to those elders, who preferred to silence me (while even denying that that was the case). German baptists, as far as that congregation is concerned, have still not â€˜endorsedâ€™ Bushâ€™s policies and hypocrisies, but they have pretty distinctly and pretty generally declared â€˜Donâ€™t bother me with that.â€™ (â€˜We must protect our truce of factions within our congregationâ€™, as is the quintessence of what some personal acquaintances told me directly was the case. If that had been given me as official reply, it would at least have been an honest answer, though even that would have allowed – a slightly more generous way to deal with my bid for a hearing.) It will be hard for me to ever see a mutual ground again with them, for I firmly hold the opinion that in terms of sincerity (also and esp. in the biblical sense) this attitude is even worse than positive delusion and stumbling failure in the face of present danger (which we are STILL not living in, generally speaking). Yes, I do, and itâ€™s very much on purpose. For, in my judgment, the baptist creed makes different pretensions as the Lutheran, and thus incurs a different set of responsibilities to live up to those pretensions. To become a bit clearer, of course, â€œfaith lacking works is deadâ€?, with anyone alike, and with this in mind I like to see social commitment and a politically attentive and benevolent mindset with Christians of every denomination. But on the other hand, there is responsibility for every denomination to keep its â€˜aggregate messageâ€™ to the outer world in accordance with biblical standards. And now, if one church has another dogmatical groundwork, i.e. a different frame of the fix part of its confession, than another church or congregation, it follows that in order to keep true to gospel throughout it must do a different work in complementing this groundwork by its varying (â€˜contingentâ€™, time- and place-related) efforts to clarify its preaching. Baptists traditionally rely much more on the individual spiritual cognition than do Lutherans, with their impressive array of historic documents of faith, and so I think it fully appropriate to expect from them a greater degree of political attentiveness too. All this may seem as though I am not thinking too warmly of my new (old) congregation at all. But I can ensure you I am. I indeed cannot guarantee Iâ€™ll not having to fight there too, very soon, but I do have a strong sense of homecoming and thankfulness. I love the liturgy and the dignified way to spend the sacraments, even though I am missing the personal note of the baptist service too, – the former appreciation outweighs the latter. But, above all, I have become aware of the huge degree of divergency between the Lutheran and the Calvinistic tradition, which, in Germany, were long ago (19th century) merged for reasons of politics and the growing indifference of believers. Baptists too, though their tradition is an alloy of diverse influences, has a huge and dominant share of Calvinism in its theological thinking. And I say that, be the Lutherans shortcomings in backing former excessions of state power as much as well they may be, ours is a different time: Our (fiendish) enemies today are rabid forms of capitalism, unimaginably depraved financial oligarchies and their attempt to decry, effeminate and dissolve the nation state whatsoever. And with the nation state threatens to go the sole sufficiently potent guardian of the poor and weak in modern society. And these are vast categories, believe me, there are a lot of people dreaming a sweet dream of grandeur. Lutheranism always was the sole reliable guardian of an independent state power, the proponent of a Christianity protected from secularismâ€™s grasp of reason as well as of a polity immunized against religionâ€™s tentacles of unreason. Even though Calvinism has had a more active part in bringing about democracy, an incredible lot of people seem to ignore that now, we are fighting against its being dismantled with no remainder left in sight. Considering these effects of the theological differences between Lutheranism and Calvinism I feel fully vindicated in my preference of the Lutheran, which I reached on both theologically-philosophical and morally-political grounds. Now, this is perhaps a little cultural rift separating me from the other posters on this site, because American Christianity is on the whole more on the Calvinist side, and I could add a lot of (earnest) observations which qualify a simple black-white picture. Iâ€™d also like to discuss some of my theological observations of how, as I see it, Calvinism and Lutheranism deal with a central tenet of protestant faith as is that of the â€˜simul justus et peccatorâ€™ (at once righteous and sinner). But Iâ€™ll let it suffice at this point with what is stated and agree to what Richard said on another thread: â€œWe are all in the proceess of converting.â€? â€“ and tomorrowâ€™s Christianity, if this world is at all for much longer surviving, will needs be much different from what we have learnt it to be in less deluded parts of history.